Take a step back to the days of the Old West. Grill up some steaks and enjoy the nights under the stars. Within walking distance, you can see a gunfight show, or be entertained at the local bar and grill. Bring your horses for miles of trail riding or hiking. Enjoy beautiful clear skies and scenic views. 30 miles north of Palm Springs in the high desert at the foothills of the San Bernardino Mountains. Close to Joshua Tree National Monument. 10 minutes from downtown shopping in Yucca Valley. Right next to Pappy and Harriets in Pioneertown. Pioneertown was founded in 1946 as a live-in movie set for the western movies that were so popular at the time. Roy Rogers, Gene Autry, Russel Hayden ('Lucky' in the Hopalong Cassidy Series), and other instrumental in the founding of the town. Since no one felt that this new town should be named after one man, it was decided to name it after a popular western singing group- THE SONS OF THE PIONEERS. 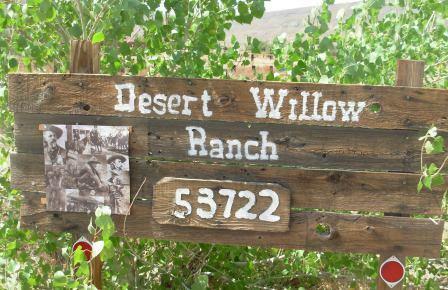 The Desert Willow Ranch was bought from Russel Hayden in 1969. What you see on the 5 acres was laid out and developed by John and Gay Smith. Everything has been solely built by this couple who dreamed of one day having a small western town others could enjoy. For more information about Pioneertown click on Pioneertown.com If you have horses and would like a local guide to show you the nearby trails for a nominal fee, please call John Z at (760) 365-3451.